GEN’s Advocacy works through international and governmental bodies to improve policies and practices towards sustainability. Since 2000 GEN has had consultative status at the UN-Economic and Social Council (ECOSOC) commission, and is represented at regular briefing sessions at UN Headquarters. GEN is also a partner of the United Nations Institute for Training and Research, UNITAR. GEN works within the framework of the UN Decade of Education for Sustainable Development 2005-2014. The Special Consultative Status with ECOSOC means GEN has a special competence in, and is concerned specifically with some of the fields of activity covered by ECOSOC. This status gives GEN Advocacy the chance to join in the work of various committees relevant to its concerns to promote sustainable communities and practices worldwide. The world’s governments are meeting again at COP24, 4 years after the Paris Climate Summit, to attempt to increase commitment towards ending our global climate crisis and meeting the Paris agreement. The focus of COP24 is scaling up government ambition: increasing financing and implementation at the local level for carbon drawdown, sequestration, and increasing eco-system services. 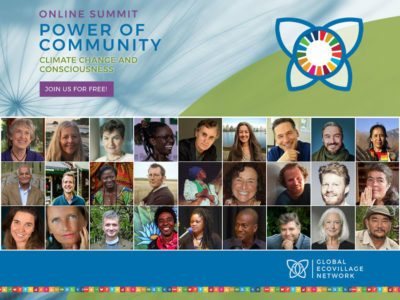 At COP24, the Global Ecovillage Network delegation will show how ecovillages are already living laboratories of climate resilience worldwide. GEN participated in the High-level Political Forum (HLPF) from the 9-18th July 2018 in New York. It was a platform on sustainable development following up and reviewing the 2030 Agenda for Sustainable Development the Sustainable Development Goals (SDGs) at the global level. The GEN delegation held an exhibit as well as a side event “Heritage for Sustainability: Implementing SDG 11.4 through local voices and global agendas for cultural and natural heritage” with Rob Wheeler as one of the speakers. Find out more at our GEN at HLPF page. GEN returned to Bonn, Germany on 6 May 2018 to participate in the UNFCCC’s Talanoa Dialogue. Member States and non-State Actors took stock of global climate action through a round table dialogue by addressing three questions: (1) Where are we now? (2) Where do we want to go? (3) How do we get there? Find out more at our GEN at Talanoa Dialogue page. Our COP23 message centered on how ecovillages are living laboratories pioneering beautiful alternatives and innovative solutions that enable villages, regions and nation states to fulfill the promise of the SDGs, the Paris Climate Agreement, and the outcomes of COP23. Our interview with GEN Africa delegates below and side events listed on our COP23 page offer powerful evidence to the transformative potential of ecovillages. Watch the webinars featuring GEN experts from our delegation in Marrakesh, or take a look at our COP22 page to see our side-events and learn more about the newly launched GEN Consultancy and the Pan-African Ecovillage Development Program. At COP21 we highlighted and featured some of the best of what is being done in ecovillage communities around the world. While we welcome the efforts of governments to limit global warming to 2 degrees and to adopt a strong binding agreement in Paris, we believe that it is essential that humanity do much better than this. Take a look at our COP21 page to learn more about our advocacy work or check out the coverage of the event. GEN was present at the United Nations Conference on Sustainable Development, taking place from 20-22 June 2012 in Rio de Janeiro, Brazil. We have uploaded two files that are worth reading (see the links below). In Cancún, on the final day, what seemed at first another impasse suddenly broke open with some astonishing and foresightful developments. Quite the opposite of another Copenhagen and more akin to what happened to the World Trade Organization when they met here many years ago, Cancún showed the power of small, rhyzomal networks to bend the arc of history. The Special Consultative Status with ECOSOC means GEN has a special competence in, and is concerned specifically with some of the fields of activity covered by ECOSOC. This status gives GEN the chance to join in the work of various committees relevant to its concerns to promote sustainable communities and practices worldwide. GEN’s activities at the UN during the period 2007 – 2009 have been dominated by participation in the preparatory stages of the 15th Conference of Parties to the UN Framework Convention on Climate Change (UNFCCC CoP-15). GEN’s principal representative at the United Nations, Albert Bates, has participated in the COP meetings in Bonn, Accra and Poznan. Albert is presently part of the NGO caucus on climate change (ClimateCaucus.net). In furtherance of the Declaration of the 60th Annual NGO/DPI Conference, he co-authored the chapter on Tipping Points for the Civil Society’s Report to the Secretary General on Actions to Eliminate Climate Change. The NGO/DPI Executive Committee and the Conference of NGOs in Consultative Relationship with the United Nations (CONGO) oversee progress of the Report and its Working Groups. GEN’s Albert Bates is part of the Working Group on Tipping Points. If that report is delivered to the Secretary General with an oral presentation at CoP-15, as it may likely be, Mr. Bates would possibly participate in the reading or oral summary. Albert Bates has been involved with UN-NGO processes since the UN World Conference on the Environment in Stockholm in 1972. After publication of his seminal reference work on climate change, Climate in Crisis: The Greenhouse Effect and What We Can Do (1990, foreword by Al Gore), he actively participated with NGOs in association with ECOSOC during the Second World Conference on the Environment in Rio de Janeiro in 1992. He was the credentialed representative for GEN in Istanbul in 1997 and for a coalition of environmental NGOs with consultative status at Johannesburg in 2002.